All of our birthday month celebrations / sales / giveaways / promotions are over … and THANK YOU again for celebrating with us!! But the fun doesn’t have to stop altogether. How about a giveaway?? For the second year, we have joined with 29 other creative bloggers / business owners, each of us sharing some of our favorite things and each of us having a giveaway. This means there will be 30 of you who will be winners in this massive giveaway! Not only is it a fun prospect to WIN, but you’re going to get some great gift ideas as well, which is just perfect as this is on our minds in November, right?? When it came to choosing my personal favorite things this year, I didn’t have to look far, because … HELLO! For SURE my current favorite things are the new holiday Stone Wrap and the 4 new Simple Notebooks that we just launched. The “LOVE” notebook sold out in a DAY(!! ), but we held onto one to include in this giveaway! One lucky winner will win all 6 Stone Wrap designs and all 4 Notebooks. Total retail value = $79.90. 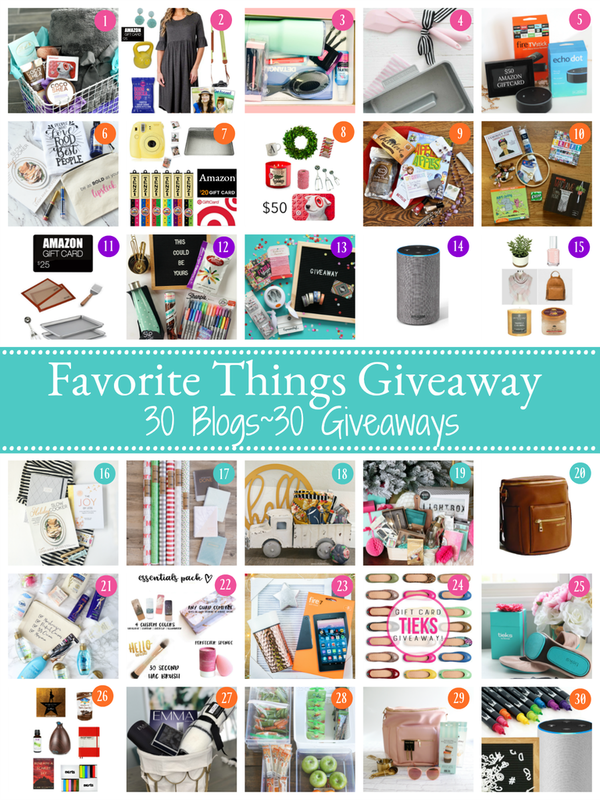 So all 30 of us bloggers / business owners are sharing some of our favorite things right now, and each of us will select a lucky winner! What you need to do is make sure you HOP to each of our sites to enter to win the giveaway on each site. You’ve got a week to hop around to all 30 blogs. While you are on each site, we invite you to click around to see what they have to share. I bet you’ll find some new favorites to follow! For more details on my giveaway, scroll below the collage. Below are the 30 gifts from 30 friends. It’s so inspiring to learn about new cool things or be reminded about some products and brands that I think are pretty great! There are a lot of great gift ideas in this roundup! To see each gift up close and to enter to win, you must HOP to each site to fill out the entry forms. Yes, you have a chance to win more than one prize. Just sayin’. *Note- if you receive an error message when you HOP, click to the blog’s home page, then it should be the top post (sometimes there are glitches on day 1). Now, here is the HOP! Click on the links below to enter each of the prizes. Sometimes within the first few hours, the direct link can get broken. If that happens, click on the home page of that site to find the post or go back shortly. Giveaway ends Thursday, November 9 at midnight, so make sure you enter each of the 30 prizes. The numbered images above correspond with the numbers/blogs below. 1. Fun-Squared // 2. Capturing Joy with Kristen Duke // 3. All Things Thrifty // 4. Pretty Providence //5. Over the Big Moon //6. Your Homebased Mom //7. Lil Luna //8. I Heart Naptime //9. Bombshell Bling //10. C.R.A.F.T. Enter to win MY gift by commenting on this blog post with your name and where you live. That’s it! Head to each of the links above to enter each individual giveaway. Just in case you don’t win, or want to gift something for a friend, here are the links to my favorites! Oh, and HEY! New friends and visitors! Be sure you’re following us on Instagram or Facebook. We’re regularly sharing inspiration about cultivating a good life and recording it. And you definitely want to subscribe to our emails. It’s worth it, I promise. Thanks for stopping by! I hope we’ll see you here again. Kristi from New Jersey!!! Love everything about Becky and her products! My name is Kelly and I am from PA.
What a beautiful giveway!! !super great for the holidays! I live in Athens Greece! Awesome giveaway! Thanks for the chance to win! I’ve been following you for more than a few years as I love Project Life. You are so gifted with creativity! If the buffalo check and green words wrapping paper were sold local (smaller town in Iowa) I would have bought them immediately!!!!! I live in Jersey City, NJ. Right across the river from NYC! Hi, I’m Dee from Georgia. Hi! I’m Ericka from Grand Rapids, MI! My name is Cara and I live in Bowling Green, KY! In fact, I’m new here! I am visiting from Kentucky!! Great giveaway!! Hi! I’m Lynda from Virginia. Such a cute giveaway! My name is Denise. I love the stone wrap and I am looking forward to receving my LOVE notebook soon! My name is Heather and I’m loving PL from Birmingham, AL. Hi from Lancaster MA. What a fun idea. Loving the holiday wrap! Such fun and festive patterns. Houston, TX. Love stone wrap! Hi! I am Sarah from WA. Connecticut! Have followed you for years and always love your style. Kristal Jacobs from Smithville, Missouri! I’m Alice and live in Madrid, Spain. I was visiting the USA last month and was hoping my local JoAnne’s would be carrying your stonewrap but they weren’t. I would love to try this out and love all the new holiday designs. Bailey from Potsdam, New York! Hello from Cassandra in California! I live in Wickenburg Arizona. I love the new stone wrap! Hi, my name is Heidi and I’m from Harrison, Montana. My name is Tabitha and I live in ILLINOIS! Elise from Salt Lake City! Can’t wait to see you at Pinners! Hi! I am Andrea from Alliance, Ohio. This is such a great giveaway! I’m Michelle, from Florida. They are all absolutely beautiful!! 😍 I’m from central Utah. Tracy Rizzo from Dover, Delaware! My name is Mel and I live in Michigan! I love the notebooks and wrapping paper!! thank you for offering this! Oh how wonderful it would be to win all of these!!! They are so beautiful! Hi! Heather from Queen Creek, AZ! Hello from Rebecca in California. I would love to try out the BH Stone Wrap. What an amazing giveaway! I’m Lisa from St. Louis, Missouri. Cyndi from Utah. Love all your products! Sherry W from St. Joseph, Illinois!!! Loving this from Montreal, Canada! Just placed another Project Life 12×12 order too! Hello from Carol in St. Louis! I love this idea, Becky! Can’t wait to hop around the other blogs, too! SO exciting! Happy Holidays to all and a big thank you! I live in a Washington state and I would love to brighten up our drizzly days with these products! Deirdre from East Tennessee here. I just love your products and content. Sara Zielinski, Niagara Falls, NY. Crystal from Greenfield, Indiana. I ❤️ All your products and have appreciated your creative inspiration for many, many years! BillieJo from Chesapeake, Virginia -I keep missing out on the notebooks as I have been a bit slow and then am frustrated. I would love to get the love notebook. Hi! I’m Joselyn, and I’m from Missouri, not too far from St. Louis. Thanks for the giveaway!! Salt Lake City. Thanks Becky and team! The STONE WRAP! Seriously, it’s the best thing ever. EVER. Sending lots of love from Salt Lake City! My name is Danielle and I live in North Carolina! I have been a fan and follower since creative lettering and I am loving the new stuff!! The stone wrap is my favorite too!! Thanks for the giveaway!! Thanks for a terrific giveaway! Congratulations Brenda! You are the lucky winner of our Favorite Things Giveaway. Please email Molly@beckyhiggins.com to claim your prize! I live in Seattle, WA. Mary from south central Washington. I’m new to your blog and am planning to do a physical Project 52 album starting 2018! I love getting inspiration on what supplies I need and how to begin. Loving the Christmas wrapping paper, too. Here in Georgia, it’s still 78 degrees–ready for it to actually start feeling like the holidays!!! Hello…love this giveaway!! I am from Waxahachie, Tx! Hello I’m amanda from spring valley New York. Stacy. I live in Denver, but will always be a Phonecian at heart! My name is Michelly Seidel and I live in Ocala, FL! Love the new holiday some wrap. Would love to try it. Thanks for the giveaway! I’m from VT. Mostly do traditionally scrapbooking, but have dipped my toes into PL. Thank you from Novato, CA for this giveaway! Hi I’m Sarah, originally from Calgary, AB Canada but now in Melbourne, Australia!! Thank you for the chance to win this awesome giveaway! Love the stone wrap and notebooks. Big fan of everything Becky!!! Oh. That love notebook…love, love, love. My name is Michele from Oswego, IL. These items are all so beautiful!! Hello from Michigan!!! This is an awesome giveaway!!!! Hi! I’m Nanette from Nashville, TN, and I love your products and the Project Life App! My name is Cassie and I live in Minnesota. Love this giveaway! Erica from Idaho, but I grew up in Arizona!! Love that place! Thank you for such a fun giveaway! Amy from Texas, hello y’all! I live in Las Vegas, NV and would love to win your giveaway! From Wichita Kansas. Love, love the note books. Love all your products!! I’m bernadette from New York!!! Hi – Kristen from Jacksonville FL here. Love the stone wrap!! Thanks for this chance! I’m most excited about that special Love notebook, since I just missed those! What a wonderful tribute and beautiful message. Hi from Utah! Would LOVE to win! Elena from NJ. Alexis from Seattle! Would love to win holiday stone wrap. Hi! My name is Jaimie and I love in New Hampshire! I have been looking for tour stone wrap at all of the Joann’s near me and have not yet found it. So I would love to win!! Hi, this is Janet Friedman from San Antonio, TX. Love the new holiday gift wrap! From Houston, Texas – home of the Houston Astros World Series Champions! I’m from MB, Canada. That gift wrap is Gorgeous! I’m Kelly from Kentucky! Love all the wonderful output- both product and personal! I love your stone wrap!!! Hi from waaaaaaaaaaaaaaaay up North from you in good ole’ Utah! Thanks for all the fun content and contests! Stopping in to say hello from Ohio! Love everything about Project Life! My name is Marilyn and I live in California. My name is Lika and I live in Belleville, NJ. I’m from Vancouver! I’ve never tried your new stone wrap but I sure love Project Life! This is my 6th year doing it! My name is Kayla, and I’m from Minneapolis! This is so fun! I’m in Vancouver, WA and am in love with your Stone Wrap! Love your concept and your products! Marta from NJ. I’d love to try the stone wrap. They are all so pretty! I’m Dana from Amarillo, Texas. Thanks for participating in this giveaway-love those notebooks! This is Shelley in San Mateo California. I’m Jen from Enterprise, Utah! I’m from a suburb outside of Seattle. Hi from Jenni in Arizona. Hello from Kim in Central Virginia! My name is Emily and I live in NW Ohio. I am Natalie from Minnetonka MN! Kerry Black from Olathe, Kansas! Hi I’m Cortney and I live in sunny San Diego, CA! Christina from PA. Have not yet tried the stone wrap, but I will have to soon! Hell0 from Ann in Wisconsin! Fa La La La LOVE!!! Hello from Woodstock, Ontario 🇨🇦 Wishing these were readily available in my area. My name is Wendy and I live in South Dakota! Hi. I’m Lisa from Central Massachusetts! And I am a fan of both Becky since her Creating Keepsakes days and of Project Life since it’s beginning! Love you guys and your products!! This is Pamela from Cedar City, Utah! Thank you for this chance! I’m Amanda from Edmonton, Alberta, Canada 🇨🇦 (where it has been snowing and looking a LOT like Christmas these last few days! ❄️). Love the stonewrap and recently bought some simple notebooks and can’t wait to try them! I’m in Southern California. I am Kathy Davis from the beautiful Ozarks, in West Plains, Missouri. I live in Lehi, Utah. LOVE the stone wrap! Have a few rolls already and looking forward to the Christmas designs. Im Brittany from Douglasville GA and i love to collect notebooks! I’m from Texas! Loved meeting your crew at Pinners! New Mexico! I love all of your stuff! My ❤️ is in AZ but living in Winnebago Nebraska. Love the wrap and notebooks. I live in Buckeye Az. I love your stone wrap! Whenever I use it people always say, “whoa this is different!” And I tell them all about it. With love from Becca from Herriman, Utah. My name is Kristine John and I live in San Tan Valley, Arizona! This chance for freebies is AMAZING…went to order a LOVE notebook about 2pm on the day after launch, and it was sold out. I love the quality of your products! Love love love your stone wrap!!! California – finally going to get some rain and start feeling like fall. Hi my name is Rachael from Brisbane Australia. Hi! I’m from Layton, Utah! Loving those notebooks and wraps. My name is Nancy. I’m from North Carolina! I’m Rebecca from Dallas, TX. Hi! I’m Charli and I live in Austin, TX. Hello, My name is Becky from Missouri! Hannah from North Idaho aka the land where my JoAnns store doesn’t carry stone wrap and they along with Michaels and Hobby Lobby have all decreased their Project Life sections. It is so sad and frustrating every time something is said to be sold in stores becuase not in mine. Really not cool especially when there are kits exclusively for certain stores. Would really love to win. I’m Mandy and I live in Northwest Arkansas. I document my memories because of you! Hi! I am Garnet from Iowa. Leah, checking you out from Hutto, Texas! I’m in love with the stone wrap and would love to have all the gifts under are tree wrapped in it! Hello from Twin Falls, ID! I love Christmas and wrapping presents. Hi from Cluny, Alberta Canada! Hello, I’m Caitie from Denver, CO! Amy from Nashua, NH would be a very happy girl to win this amazing giveaway. The notebooks are my fav!!! I am also not sure I can use regular wrapping paper again after using the stone wrap!!! These look so fun! I live in Layton, UT! Hi, my name is Lori and I am from Lee, FL and excited about this year’s give away! Moriya Olsen from Henderson, NV. I just purchased stonewrap and notebooks for Christmas gifts! I love them both! Following you from The Woodlands, TX. I love the SW patterns! Love all your things. Wish more was available in Canada or shipping to Canada! I’m Sarah from sunny San Diego, CA! Becca from Provo, UT. Pretty paper! And notebooks, always love! Living on the Oregon Coast. Michelle from GA here! Good Luck everyone! Hi! I’m Melissa from East TN. Love the stoneware – it is so pretty! I’m in Murrieta, CA. Thank you for playing along in the hop!!! I’m Torri and I live in Colorado. fun giveaway! Hello From Myrtle Beach SC…. Love the new stonewrap!! I want them all :) And it would be a great birthday present to myself! Hi, my name is Tania and I live in Spring Hope, NC. I’m from Bow, NH but living in Ft. Bragg, NC! I love your stuff so, so much! I am from Caldwell Idaho! My name is Dianne Lanier, and I live in the beautiful Rocket City, Huntsville Alabama! I’m Jill and I live in Albuquerque, NM! My name is Bekah from Centerville, UT! Hello! I’m Jackie from Benson, AZ! From Auburn, WA but currently living in OK with my hunny! From Auburn, WA but currently living in OK with my husband! Hi I’m so excited for Christmas and that wrapping paper is so cute. I’m in Pocatello, Idaho. Love the stone wrap and fun notebooks! I live in Kentucky! Love the Stone wrap! Just bought a roll and now I want it all! Thanks for the giveaway opportunity. My name is Deborah and I live in Orlando, FL. Hello! My name is Cindy and I live in Tennessee. My name is Alison and I live in Manhattan, KS. Patty from Cottonwood Heights Utah! The stone wrap is the absolute best paper around! I like to make gift bag and card sets with gift wrap paper. I’m currently doing a big PL album, around 400/500 pictures. CHALLENGING!! I live in Miami, Florida. Gisela. Hi! I’m Stacie from Alabama. I would love to try your stone wrap and notebooks. I’ve been a fan for 9 years now and money is tight for us this Christmas but I would love to bless my 3 Childrens teachers with nice gifts! They do so much for the kids! But for the record, my heart ❤️ will always be in the PNW! I’m Sunnie from Deer Trail, CO! Live in Georgia, have bought one roll of wrap and it is great! I love the wrapping paper and notebooks. Thanks for the chance. Hello I’m Diane from Florida. Thank you for a chance to enter the give away and to sign up for your blog. Hey from just outside of Fort Worth, Texas! You can never have too many notebooks! Hello from Provo, Utah! Hi! Deborah from Southwest Ohio. I’m Rebecca living in Alabama! Darcy from Stansbury Park, UT! Super cute giveaway, thanks for the chance to win!! I’m Cheryl from Southeast Kansas and I love notebooks!!! Hello from San Ramon, CA. Hi, I’m Heather from Rancho Santa Margarita, Ca. Your brand is amazing! But it’s not just that, it’s what you are doing with it that is so inspiring! Jenny Andersson here, from the south of Sweden. My name is Marci Modersitzki and I’m from Highland, Utah! Hello from Jenny in Texas. I am loving that Stone Wrap! I’m Terri and I live in Michigan! My name is Terry and I live in Missoula, MT. My name is Rachel and I’m from Wisconsin! Grand Junction, Colorado. Thanks for the opportunity! I am from O`Fallon, Missouri. Thank you for the giveaway! I am Sue from Shelby Township, Michigan! I’m Maria Miller and I live in Lacey, Washington. I am currently in Livermore, CA, but am moving to Santa Clara, UT! Such pretty papers. I am from Auburn Maine! I live near Vancouver, Canada. Hi I am Debbie from Barrie, Ontario, Canada and I love the idea of making the moments of our lives more meaningful and preserving the memories. Thanks for the opportunity! Hi I’m Cherie From North Carolina! Greetings from Saint Louis, Missouri!! Show Me a winner! Thanks for the chance! LOVE your stone wrap and would love to try the Christmas ones and the notebooks! I live in Louisville and I LOVE all things PROJECT LIFE!!!! Hi! Morgan here from San Diego, California! My name is Cynthia and I live in Durham, NC. Thank you! Hi From Phoenix! Would love to win! Love the cute stone wrap; so wonderful for the holidays! Hi from Riverside, CA. My name is Meagan. I live in Salt Lake City, Utah! Love love love the wrapping paper! Hugs from Pittsburgh, PA! I’m Melody from Cedar City, Utah. I just met you in person Saturday evening. Such a pleasure! Michelle Laulu from Magna, UT. Hello! I’m Krista from Flagstaff, AZ! Stephanie Y. – The Colony, TX. Thank you so much for the giveaway!! Hi – this is Carol from Spring Hill, Tennessee. These are wonderful goodies for some lucky fan!! Mary Gardner in North Carolina. Hi, I’m Hannah from Sacramento, CA! Sarah Oswald from Barnesville, PA. Thanks for the chance to win! Greetings from San Antonio, TX! Thank you for the opportunity to win. I’ve been a fan of yours for a long time!! This wrapping paper cuts like Buttah! And the notebooks are my new favorite way to have a cute to-do list each day! Thank you for the chance to win. ❤ Have been stocking up on the notebooks for Christams! Casey from Washington. Heather Z from Woodbury, MN. Hi I’m Niki McDowell and I’m from Murrieta, CA. I love your stonewrap and want to try out your notebooks so bad! I live in Queen Creek, Arizona! Hi from Kansas City! I love all of your products, and the app has changed my life! Hi from Mesa Arizona! This is Lainie! I’m Jackie from the SF BAY Area. All the heart eyes for stone wrap!!!! Hello from Star Valley, Wy! I have been following you and using the project life app for a year now, and it has totally changed my life! Thank you! Aloha from Erin in Oahu, Hawaii! Hi I’m Kristie and I live in Arizona! My name is Ali from Flagstaff! Hi ! This is Emma from Iowa! Would love to win those gorgeous goodies! LOVING my notebooks, need to get my hands on some stone wrap. Hey I am Karen from Lakeland TN.. I would love to win the giveaway!!! Hi from Jody in California! Karima Farid, from Oman. I’d love to win this ! Hello and Hope I win! 🙋 Hello from Riverside California. I forgot to complete my order on the first day & missed the Love Notebook. I’m Terra from IL. Thanks for the great giveaway. Hello from Lake Benton, MN! Hello from Debbie in Greenville, SC. LOVE the stone wrap! Jennifer White from Kenosha WI!!! from Kenosha WI!!! Love the stone wrap! Hello from Circleville, OH!!! These are beautiful giveaways. Excited about he stone wrap. Oops! I didn’t put where i was from! Panhandle Northwest Florida! Ordered both the stone wrap and notebooks and love them all! I’m from Iowa. Hi! I’m from CO Springs, CO! Would absolutely love to win. Thank you! Amanda from Indiana! Love following you. I watch your Instastories every night before bed! Hi! I’m Heidi and I live in Ireland! I love everything that is Becky Higgins! Love from New York! Hi! I’m Melissa from Herriman, UT. Hello from Northport, Alabama! I love PL! I love your products! I live in Utah. What an amazing opportunity. I’m Emma and currently live in Sudbury, MA having recently moved from England. Thanks for all your memory keeping creativity. It’s a true inspiration. Hello from Atlanta, GA! Love your stuff! Hi! Teresa from Naples, Florida! Shelise from Utah! I can’t wait to try your new products!! Carl from Port Charlotte, FL! Thanks for the amazing giveaway! Hey Melanie! I’m front Canmore! I’ve been eyeing the notebooks for everyday to-do lists that you have shared. Hello! I’m Marryl from the Philippines but now on vacation in Canton, Michigan. Hi from Nancy from Wisconsin! Thanks for the chance to win! Happy Holidays from Friendswood, Texas. GO ASTROS 2017 World Series Champs!!! Yippee! Thank you for the chance to win some freebies! Cally checking in from Minneapolis, MN! Everyone calls me Bessie, and I live in central Pennsylvania. Love ya Becky in Coaldale, Alberta, Canada!!! I’m Robin from prosper, Texas! Your favorites are my favorites too!! Hi there from San Jose, CA! I would love these notebooks for bullet journals and gifts, and the stone wrap would look so awesome under the tree! Cute paper – the “merry Christmas” is my favorite. Hello from SLC, UT! Can’t wait to see who wins!